Erma rinsed several bunches of grapes (not bothering to remove the stems or the leaves) and put them into the top pan, which is the steamer basket. The Mehu Liisa has three pans that stack together. The bottom one holds the water that will steam the fruit; grapes in this case. The middle pan is shaped like a bundt pan. The steam comes up the open center and into the steamer basket, where it opens the juice cells in the grapes. The clear purple juice drips down into the bundt-shaped pan below. 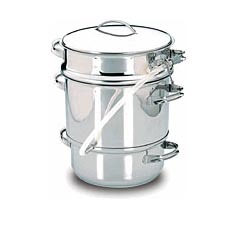 It’s not diluted by the steam because the steam escapes through the lid. As Erma and I talked, I could see grape juice filling up the hose that came out of the bottom of the juice pan. When there was enough juice, Erma drained the hot juice into one of her prepared jars, capped the jar and set it aside. Done. I mean, done-done. She didn’t even need to process the jars because both the juice and the jars were boiling hot. And there was no squeezing squished grapes through messy cheesecloth and no water bath canning. 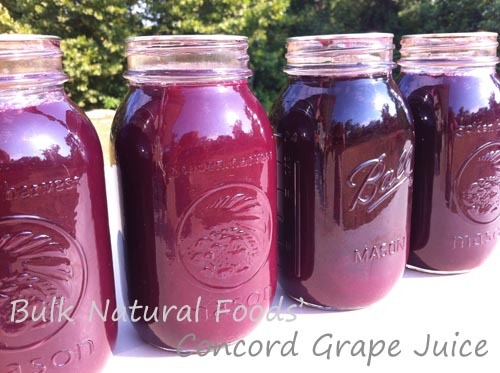 Just beautiful, sweet grape juice without any hassle. All I can say is our old way of making grape juice is long gone! (And we’re getting more grapes this year…)Watch us making grape juice with the steamer juicer on the video we made here.